Life With a Whisk: Morning perfection. Scones are just about my favorite breakfast pastry. I would maybe say a flaky, buttery, warm croissant, but if I'm looking for something to really tide me over until lunch and not just a singular perfect bite (that is rarely all that perfect anyway), I'll pick the scone. And then for afternoon tea!! If a scone-only tea is offered, I will happily just order that, as good as the sandwiches and petit fours may be. With a smear of raspberry jam and a dollop of clotted cream, I am in heaven. And there are so many kinds of scones! There are the dense, craggy ones, tender, biscuit-like ones that break off into layers, the crumbly store-bought variety that are best bitten straight into rather than broken off into pieces (lest you enjoy sweeping crumbs in your mouth), glazed, dried or fresh fruit-embedded, enhanced with chocolate. 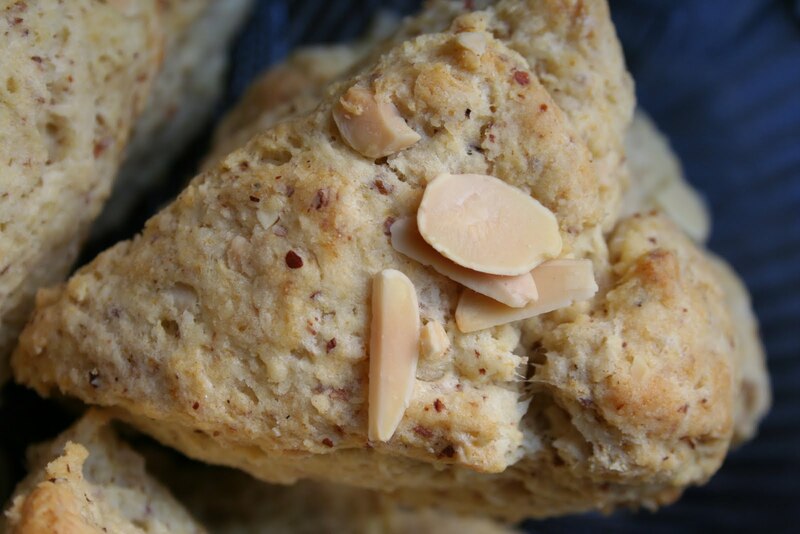 My idea of perfection is the biscuity kind with a firm shell that behooves breaking the scone off into pieces, pieces that break off almost layer-like, and that go from hand to mouth with ease. Butteriness is a given. This week's Tuesday's With Dorie pick by Mike of Living Out West was it. Another super simple recipe, I was excited to whip these together before work yesterday morning. Perhaps freshly ground almonds would have been more fragrant, but I decided to give my roommates a break and didn't run the food processor at 7am when I had Trader Joe's almond meal on hand. For anything not particularly refined, I love using their almond meal for the flecks of skin and not-too-fine grind that I prefer against the tongue. Whisk together the dry ingredients, cut in the cold butter with your hands, toss together with the wet ingredients, shape, and off into the oven they went. These were the perfect size, too. They puffed up beautifully, held their form nicely, had a lovely golden tan, and just seeing the almond flecks throughout made me smile. Paired with Tiptree strawberry jam they were so good, and with sharp cheddar cheese, even better! 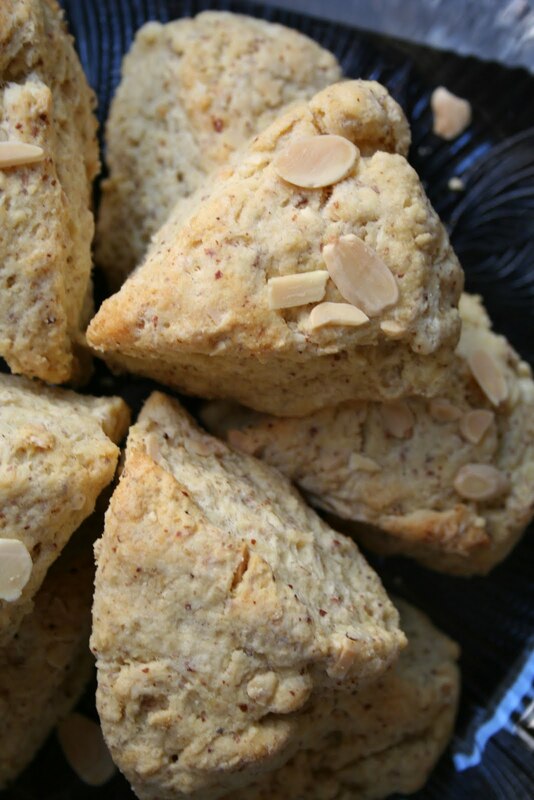 Scones allow for endless variations so walnuts, pecans, pistachios, along with dried apricots, figs, sour cherries, and spices might all be experimented with soon! As long as the texture maintains, I can do no wrong. Wow, what a wonderful post - you've really captured the essence of texture, etc. You know your scones. :) I'm so glad you made them and enjoyed them (they're a favorite of mine)! And thanks so much for baking along with me this week! they truly do look like perfection! and i love your description and writing too! maybe one day i'll love scones as much as you, for now... i'm still looking for my perfect scone. yours look fab!